Unfortunately there are some neighbours out there just looking for an excuse to have a whinge and make your life difficult. So let’s look at things in a bit more detail. Before we go any further it’s important to define the applicable Laws and terminology for air conditioner noise regulations so we can better understand what we are supposed to be doing. These guidelines are based upon two important other pieces of legislation. The Protection of the Environment Operations Act 1997 (POEO) which states ‘offensive’ noise must not be created. 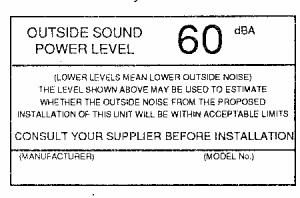 Clearly this is subjective but, for air conditioners, most councils would apply a limit of the existing background noise level (at the quietest time of day that the AC is to be used and with any extraneous noise, including the AC, off) plus 5 decibels (dB). At night time the POEO Noise Control Regulations 2008 would apply; at this time the air conditioner must not be heard in any adjoining residence even if they have their windows and doors open. Now, there is a difference between background noise and ambient noise. Ambient noise takes into account all the noises at a certain period in time. Background noise is defined much more tightly and is the noise which is the quietest 1.5 minutes in a 15 minute period. The guidelines above refer to background noise not ambient noise and this has certain implications. ‘One off’ sounds such as an aircraft taking off or a train passing are clearly not going to be included in background noise, whereas a busy road in use 24/7 would be. Another important definition is the sound an air conditioner makes. All systems come with two sound ratings which upon first glance appear fairly confusing. Sound Power Level – sometimes known as acoustic power level, is a measurement of the sound energy emitted from a source of noise. The advantage to manufacturers of quoting this is that it is a value associated with a device and is not location or distance dependent. Sound Pressure Level – is the measurement of the sound energy at a defined distance from the source. Most manufacturers quote the external value at a distance of 1.5 metres from the condenser. Get the basics right. Minimum 450mm from any boundary although preferably 3 metres if you can manage it, not over 1.8m high, not in front of the building line to the primary road and not close to your neighbours’ bedroom window. Do that and you’re pretty well there. The only absolute way to be sure that you will comply with the noise part of the regulations is to commission an acoustical survey before installation. An acoustical consultant engineer will measure the background noise, find out the sound power level from the supplier and predict the sound pressure level at your neighbouring boundary, and in the end you will have a report that you can use to select a system that meets all your needs. It costs approximately $1,000, +/- $400 depending upon complexity. There are a number of other things you can do to limit potential problems. Talk to your neighbours, they may be absolutely fine about it anyway. It’s amazing how many people don’t do this when it could avoid a potential problem in the future. Locate the condenser as far away from the neighbouring boundary, and particularly neighbouring windows and bedrooms, as practicable. Look to see if your neighbours on either side have air conditioning themselves. If so positioning your condenser on the same side is likely to be perfectly OK. Select a quiet system; Daikin ducted and split systems are incredibly quiet. Select a system that has a night mode allowing you to further reduce the sound levels at night time; all Daikin systems have this. Install a high acoustic fence as a reflecting barrier. An acoustic fence is one without any holes or gaps, such as lapped and capped timber or Colorbond steel. It should be noted that it is quite possible to hear an air conditioner even if it is 10 – 20 dB below background noise; the implications of this are clearly that even though an air conditioner is quieter than background noise during the day, you still may not be able to use it at night time if your neighbours object. Remember this is all so you don’t need to apply for a DA. So, if you think there are likely to be problems then formally lodging a Development Application may be the way to go. Please understand that unless you commission an acoustic consultants report then it is not possible for us to say with 100% certainty that your installation will comply with the regulations. We would have to use guess work to estimate the sound pressure level at your boundary and we are not competent engineers in this field. In practice this means there may be additional costs incurred due to compliance issues should they arise. I’d like to thank Ken Scannell MSc MAAS MIOA of Noise & Sound Services for his invaluable input into this article. Institute of Acoustics Diploma in Acoustics and Noise Control – including Architectural Acoustics and Noise Control Engineering. Ken has worked in this area since 1976 both in Europe and Australia. He spends most of his time solving industrial and environmental noise problems. Ken is a leading authority in noise management, has served on the Australian Acoustics Society Committee and has served on the Standards Australia Committees for acoustics (AV/1 and AV/3). Ken has published 35 technical papers on noise and vibration between 1986 and 2008 including papers presented at both Oxford and Cambridge Universities in the UK. He is a member (and past NSW Divisional secretary) of the Australian Acoustical Society (MAAS), the British Institute of Acoustics (MIOA), and an Associate Member of the Acoustical Society of America. Ken regularly carries out introductory noise training courses for the NSW Office of the Environment and Heritage (OEH), and has carried out training for the NSW Road and Traffic Authority (RTA) and the Ministry of Natural Resources and Environment, Samoa. He has been accredited to carry out the WorkCover (NSW) noise-training package. Have other issues with your AC? Have a look here. Need a tech on site? Have a look at what’s involved in a diagnostic call out. Maybe check out the FAQ for answers to your questions. Not sure whether to explore AC? Check out the advantages here. Get some guidance on maintenance. See how dehumidification can help you.